Orange Belgium proudly opened its brand new data center in Hoboken, Antwerp today, in presence of Flemish Minister of Innovation Philippe Muyters. The 1000 m² data center will help Orange to manage the growing demand for mobile usage of its customers by handling the billions of day-to-day connections Orange customers make to surf, call and sms. 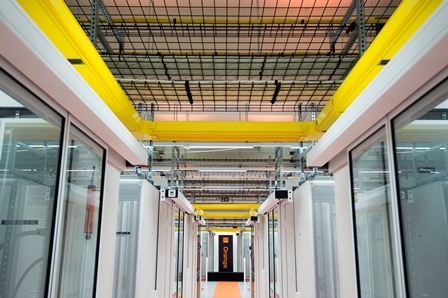 Orange Belgium invested over 14 million EUR in the construction of this best-in-class data center. Orange Belgium started the design of the building in 2016 together with META Architects and Engineering Offices Ingenium and Deerns. The goal was to create an economic data center that excelled in performance and sustainability (with 3MW electrical capacity and a Power Usage Efficiency of < 1,2). The construction was ensured by Engie Fabricom, started in May 2017 and was finalized by the end of the summer of 2018. Today Orange CEO Michaël Trabbia and President of the Board Johan Deschuyffeleer officially opened the data center in presence of Flemish Minister of Innovation, Philippe Muyters. The data center that will be used for radio, telecom and IT equipment offers a total capacity of more than 500 high density 52 units racks, installed on the equivalent of 12 tennis courts. The impressive building is far more eco-efficient than a standard data center, as it is able to use freecooling for 98% of the year. It is also highly secured and resilient thanks to systematically redundant critical elements. The new data center has a specific energy-friendly design of closed hot aisles cooled with an adiabatic free-cooling system. This frames in its sustainable strategy that makes Orange the only CO²-neutral telecom operator in Belgium for its operations (network and buildings). After several years of efforts to strongly decrease its energy consumption, Orange became CO²-neutral in 2014 thanks to energy reduction and optimization and CO²-compensation. Orange is certified by CO² Logic.